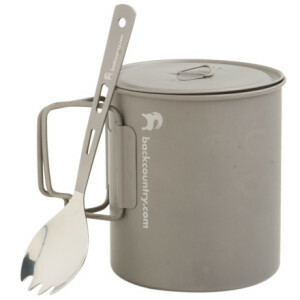 So while I love my GSI cook set, I have finally decided to get a real light-weight solo cook pot, so I opted for the Backcountry.com 700 ml Ti cook pot with Ti spork. This is a sweet little cook pot. It weighs nearly nothing, or so it seems. It weighs a mere 4.3 oz with the stuff sack and the lid. I can leave the stuff sack behind to save nearly an ounce off of that. The Ti spork weighs a whopping 0.5 oz. 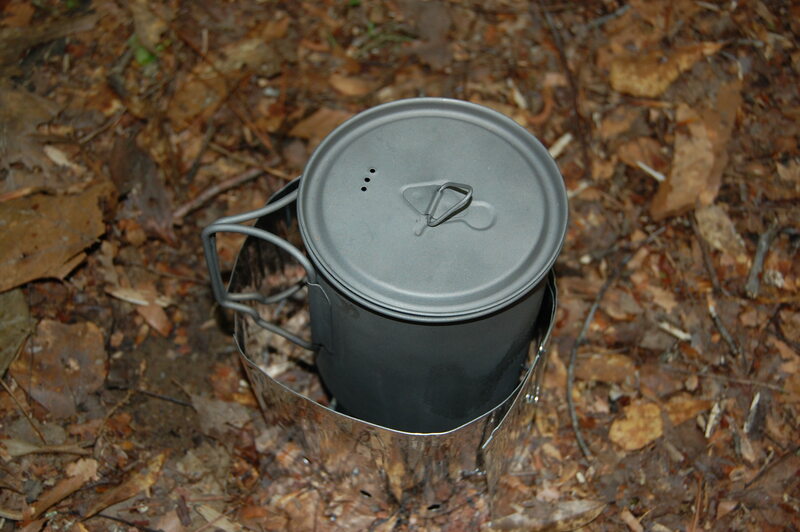 I have not been able to take the cook pot out on a hike yet, so I have only used it here at the house so far. I have used it with all of my stoves (alky & canister) and I am currently looking for the proper alcohol stove to use with it. Due to its narrow diameter (3 5/8″) it does not work well with a lot of the alcohol stoves. I believe I am going to purchase the Gram Weenie Pro stove to use with it, but I will see. Once I get some field use out of this pot I will be able to tell more about it and write a more in depth review. For now the only down side I noticed is that since it is a single wall, the actual pot needs about 30 seconds to a minute to cool down before being able to handle. I may try and look for some rubber handles to put over the handles like what is offered on some other Ti pots. But since I am planning on using this as both my cup and my pot, I will need to take extra precautions not to burn my hands on the handles or my mouth on the lip of the pot. Some people have complained about the lid on this pot. Since it is not aluminum it is not as rigid, so some people say it does not stay on the pot well. The Ti lid is actually made to be a press fit and since it is so light and thin, it can bend easily, but so far it has done real well for me, both when hot and when cold. Actually I have learned not to put it on tight when boiling my water so that I can get the lid of easily to check the status of the water. Otherwise I am trying to hold the pot down (which is hot) while pulling the lid off. It can be difficult. Update: Today I took this pot and spork combo with me on a day hike to Tishomingo State Park. I used the pot with the Gram Weenie Pro stove to boil about 2 cups of water so that I could have a cup of coffee and some Oatmeal. The handles do definitely get hot (which I already knew this) so I had to use a hanky to take the pot off the stove. However, after about 20 seconds the handles are completely cool, and I was able to hold the cup by the handles with no worries. I did not use the pot to drink my coffee from, but instead used a cup I brought along. As for the spork, well it was a spork. I used it to eat my oatmeal out of the oatmeal pack. One thing I noticed is that the metal tines can punch a hole in the bag if not careful. Not that they are sharp, or even big, but the fact is that it is a metal point, and it does have the ability to puncture soft or thin items. The spork does not heat up from being in the water or using while eating hot meals, so this is good. So, this is all for now. Once I take it out some more maybe I will have more to say about it, and I will be sure to report back. It’s the twenty ten theme. I love that it has drop-down boxes.